For a decade I’ve been running charters to catch saltwater salmon. During that time I’ve always run herring paired with a hoochie. To be honest when the salmon are thick you can catch them on anything. 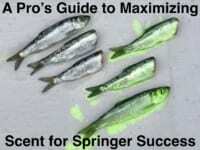 However, when fishing gets tough brining baits and adding color can help catch rates skyrocket. On a slow year doing so is imperative. 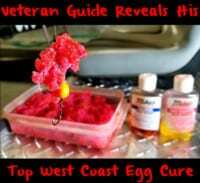 Brining/coloring bait firms it up enabling you to troll longer and the scales to flash and shine like they would if they were alive. The added color always seems to bring more fish to the boat. There are days when the salmon only eat blue, red or chartreuse hoochies so why wouldn’t you match your bait those colors as well? It always surprises me how many anglers don’t. We do. We run four boats daily during the summer. Everyone asks us does this stuff (the blue and chartreuse brine) work? I’m always honest with people. I tell them on a good day everything works. 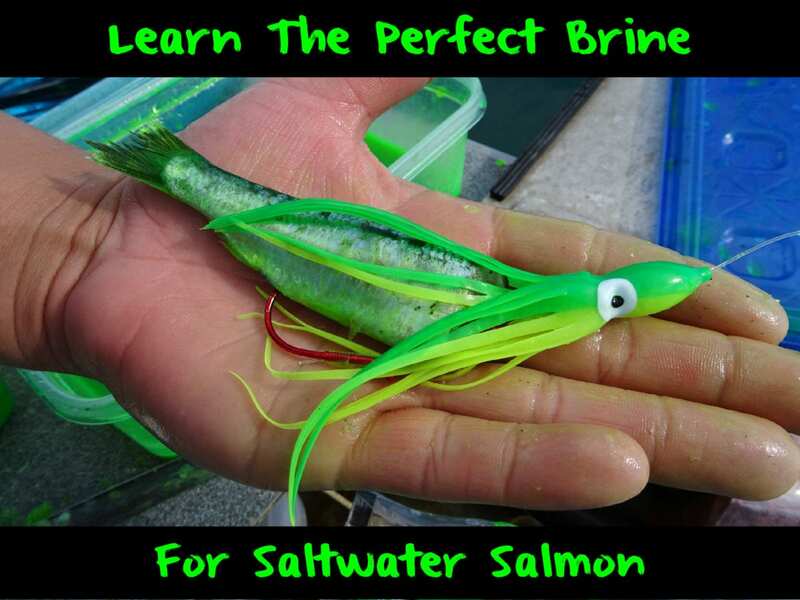 But, when fishing isn’t spectacular the brined baits out-fish baits that aren’t brined. And, as easy as it is to brine them why wouldn’t you? We use Green Label troll herring, which always comes in a tray. You don’t need to thaw them first, but I do. Either way, they are going to thaw in the brine. Whether you thaw them first or not is personal preference. Every day I fill a container of Chartreuse and Blue Fire Brine. Even though many use Natural Fire Brine those are our favorite colors. It’s what’s always worked. I’ll start brining them red at the end of the season when the salmon get more aggressive as they prepare to spawn. Later in the season we will have trays of red, blue and chartreuse brined bait. As simple as it sounds all you need to do is pour the Fire Brine into a container or Ziploc. It does the rest for you. There’s no trick to this. Add bait, leave overnight and it’s ready to fish in the morning. Let them sit a minimum of four hours. I prefer overnight. With a soak that long the color penetrates the bait well and doesn’t wash out. On the other hand, if you are short on time let them sit in the brine for an hour and add a squirt of Fire Dye. The dye works instantaneously. You can pair the Chartreuse Fire Dye with the Chartreuse Fire Brine. The same works for the red and blue. The dye is like food coloring on steroids and makes the bait stand out. It’s a must have in the boat for any saltwater salmon angler. Some anglers run whole herring. However, we cut plug them. At this point, if you choose to cut plug, now is the time. After doing so I’ll pair the color of the brined herring to the color of the hoochie we’re going to troll. It’s now time to go fishing. Editor’s Note: Tim Bouchard operates Valdez Outfitters. For information on their Valdez, Alaska, halibut, salmon, rockfish and lingcod charters please visit www.valdezoutfitters.com.